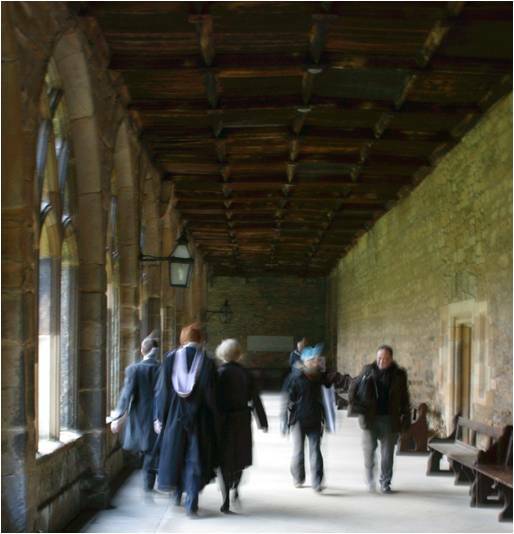 For many people Durham Cathedral will be familiar as a location in the Harry Potter movies. However, for me it triggers memories of walking around the cloisters discussing Erwin Schrodinger’s arithmetical paradox: there seems to be a great number of conscious egos creating their own worlds but only one world. Each of us appears to construct our own domain of private consciousness and Schrodinger identifies the region where they all overlap as the ‘real world around us’. However, he raises questions such as, is my world really the same as yours? Schrodinger proposes two solutions to the paradox: either there are a multitude of worlds with no communication between them or a unification of minds or consciousness. Schrodinger found ‘it utterly impossible to form an idea about’ how his ‘own conscious mind should have originated by the integration of the consciousness of the cells (or some of them)’ that formed his body. Recently this has been addressed by Susan Greenfield, who has proposed that short-lived coalitions of millions of neurons are responsible for consciousness. These ‘neuronal assemblies’, which last for fractions of a second, link local events in individual cells with large scale events across the brain and many of ‘these assemblies flickering on and off somehow come together to provide a collective continuous experience of consciousness’. In other words, our consciousness arises as an emergent behaviour of the myriad of interacting networks in our brain. It seems no less fanciful that our individual minds networked together to generate a further level of emergent behaviour equivalent to the unified mind that Schrodinger conceived though, like Schrodinger, I find it utterly impossible to form an idea about how this might happen. Perhaps, at some level we are creating a unified mind via the digital hive mind being formed by the digital devices to which we delegate some of the more mundane aspects of modern life [see my post entitled ‘Thinking out of the skull‘ on 18th March, 2015]. However, Greenfield worries about a very sinister potential impact of our digital devices, which is associated with the stimulation they provide to millions of the younger generation. She thinks it could lead to small-scale neuronal assemblies becoming ‘the default setting in the consciousness of the digital native, to an extent it has never been in previous generations’. In other words we might be losing the ability to create the emergent behaviour required for consciousness and shifting it to our digital devices. Perhaps we are closer than we think to the vision in Maria Lassnig’s painting of the lady with her half of her brain outside her skull? [see my post entitled ‘Science fiction becomes virtual reality‘ on October 6th, 2016. Erwin Schrodinger, ‘Mind and Matter – the Tarner Lectures’ in What is Life?, Cambridge: Cambridge University Press, 1967. Susan Greenfield, A day in the life of the brain: the neuroscience of consciousness from dawn to dusk, Allen Lane, 2016. Clive Cookson, Know your own mind, FT Weekend, 15/16 October 2016, reviewing Greenfield’s book. Nilanjana Roy ‘What it means to be human’ FT Weekend, 17/18 September 2016. This entry was posted in Soapbox, Uncategorized and tagged arithmetical paradox, consciousness, digital hive mind, Durham cathedral, emergent behaviour, Greenfield, Harry Potter, Maria Lassnig, neuronal assemblies, Schrodinger, virtual reality on November 30, 2016 by Eann Patterson.